I spent several hours in the exhibit hall yesterday trying to make my way through my proposed “game plan”. Didn’t even get close. I kept getting sidetracked by one thing or another. Swisslog – Swisslog has been around for quite some time. Most people know them as a pneumatic tube company, but they have several other pieces of pharmacy automation and technology. Yesterday I spent all my time in the Swisslog booth looking at BoxPicker. The technology is interesting for several reasons: it can have multiple workstations in use at once, doesn’t require much clearance, can be used to bridge the gap between a sterile and a non-classified work area, and so on. CareFusion – My sole purpose for visiting the CareFusion booth was to get an update on their Pyxis Prep product; a semi-automated manual i.v. workflow management system. The system was announced at last year’s Midyear event. I got the full demo. I’ll have more to say about Pyxis Prep in the near future. Don’t go looking for information at the CareFusion website, because you’re not going to find much. MEPS Real-Time – I’ve written about MEPS several times in the past. They’re probably best known for their Intelliguard Kit and Tray Management System. Well, they’re branching out. The booth had a couple of new products on display. 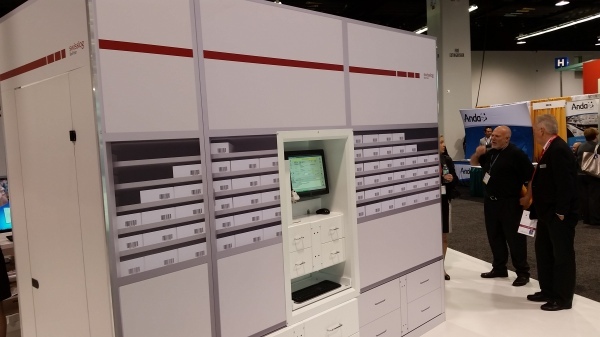 The first was a new inventory management system that includes temperature controlled cabinets with real-time temperature and inventory monitoring. Hmm, where have I heard that idea before? Great concept for certain niche drugs, i.e. expensive or controlled. 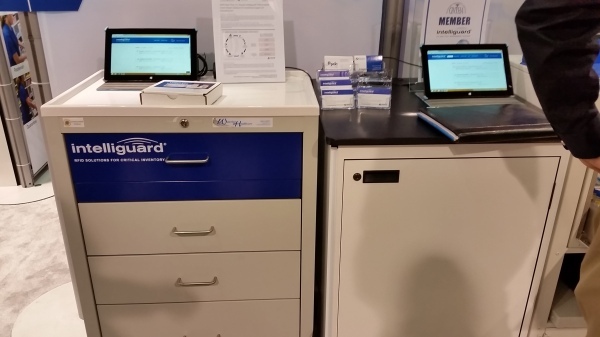 The second product is an RFID-enabled Smart Drawer for anesthesia supply carts. As it was explained to me, the smart drawer solution is actually a service provided by MEPS to any anesthesia cart vendor, i.e. OEM type stuff. If you’ve ever read my blog, you know that I’m a fan of RFID in certain situations. I spent over an hour at the MEPS booth looking over their products. It’ll be interesting to see how they do over the next 12 to 18 months. EQUASHIELD – This one caught me off guard. I did not expect to spend an hour in the EQUASHIELD booth speaking with one of their executive officers. EQUASHIELD is a closed system transfer device (CSTD) that’s used for compounding hazardous drugs. While CSTDs are nothing new, the EQUASHIELD device was pretty slick. What I learned requires more time and space than I have now. More to follow at a later date. 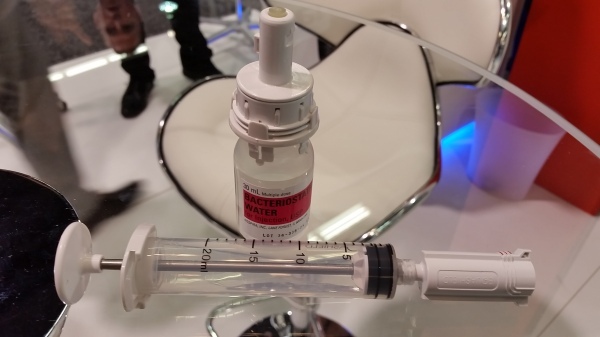 MedKeeper – MedKeeper’s Verification product is one of several that Mark and I cover in In the Clean Room. I stopped by their booth to get an update on the product. I also discovered that MedKeeper will be launching a new sterile compounding educational website sometime in early 2015. Stay tuned for more on that. BD – As with MedKeeper above, BD Cato is covered in our report. BD has introduced new imaging capabilities to go along with their gravimetric-centric semi-automated manual i.v. workflow management system. The camera design is pretty neat, as it doesn’t appear to interfere with the previous workflow. This will require its own post. More to follow. I also got a peak under the hood of BD’s new Intelliport system. They wouldn’t allow me to take any phones or capture video of the demo, which was disappointing, but suffice it to say I was impressed. You can read more about the technology at CRISI Med. I’ll try to get back on track today and see if I can knock out my list of must-see items.